REIDsteel have a worldwide reputation for excellence in the custom design, engineering, fabrication and erection of a wide variety of pre-engineered steel frame buildings and structures. 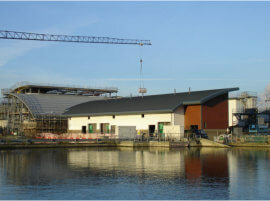 We are specialists in steel building design and are a manufacturer for industrial facilities, factory buildings, aircraft hangars, steel highway bridges, industrial buildings, steel framed commercial buildings and waste/recycling facilities and also design and build a range of low cost prefabricated steel buildings, for all manner of uses. One of the UK’s top steelwork construction & cladding companies, REIDsteel also specialise in the design and construction of hurricane resistant structures, as well as tsunami resistant buildings and earthquake resistant buildings for the world’s more volatile climates. REIDsteel can also advise you on strengthening your existing building to better resist earthquakes, or to make them life-safe. REIDsteel design and construct aircraft hangars of all sizes from wide span hangars to accommodate Boeing 747-400 and Airbus A380 aircraft to bespoke light aircraft hangars, as well as cantilevered hangars which permit unlimited clear spans. 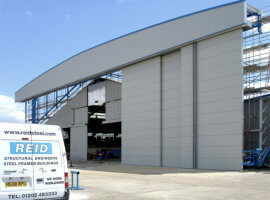 We do the complete structural design and construction of each aircraft hangar and use only the highest quality British steel, which can be supplied hot dip galvanized if required. 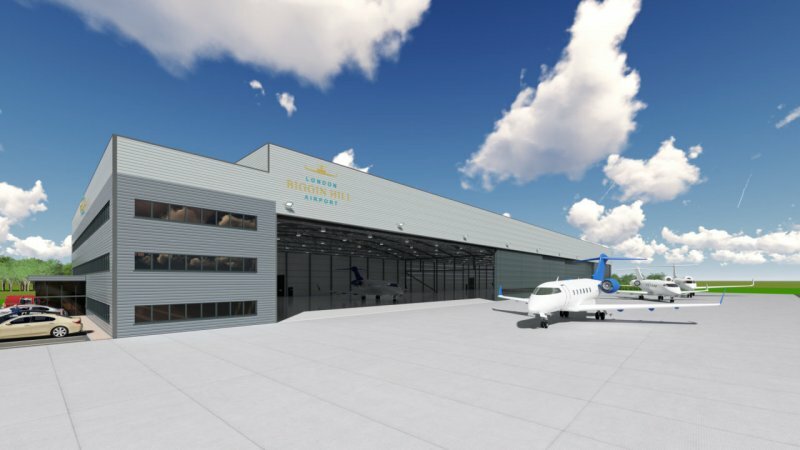 With our specialist knowledge we can design aircraft hangars to withstand high wind speeds, seismic loads or arctic snow loads if necessary. We also offer as part of our service the ability to design our structures to accommodate the largest of overhead cranes and gantries, the ability to detail and install glazing and cladding systems complete with integrated personnel and vehicle access doors along with many other accessories. Many airplane hangars have workshops, offices and permanent docking built in. 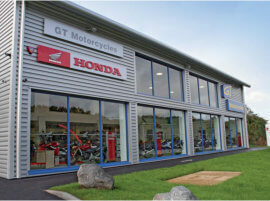 All are supplied and installed in accordance with the client’s individual requirements. 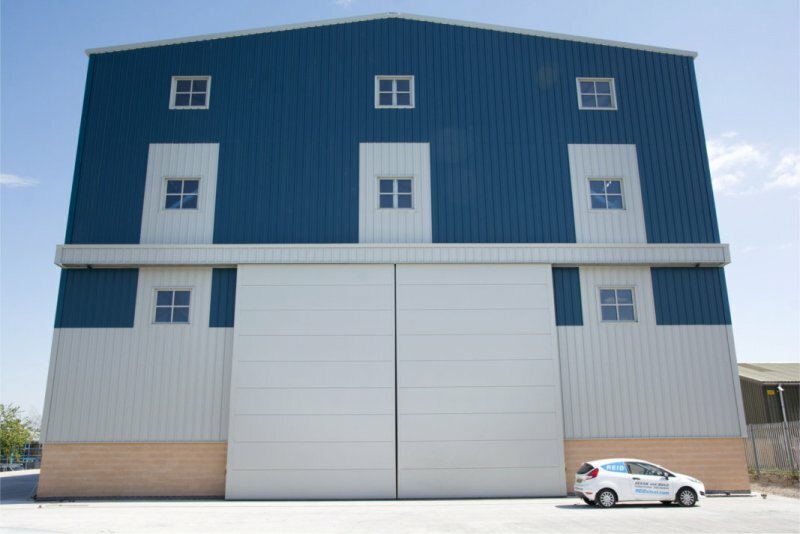 With our specialist knowledge we can design a warehouse building to withstand high wind speeds, seismic loads or arctic snow loads if necessary. We also offer as part of our service the ability to design our steel frame structures to accommodate the largest of overhead cranes and gantries, the ability to detail and install glazing and cladding systems complete with integrated personnel and vehicle access doors along with many other accessories. REIDsteel offer bespoke design, construction and erection of specialist industrial steel buildings and steel frame agricultural buildings including full structural design and build covering all aspects of steelwork prefabrication. 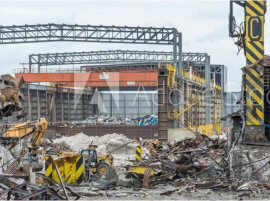 We can also arrange shipment of the steel industrial building worldwide and our team of erectors take care of construction of the steel frame to the highest standards. REIDsteel undertake the complete structural design and construction of the commercial building utilising only the highest quality British steel, which can be supplied hot dip galvanized if required. With our specialist knowledge we can design steel buildings to withstand high wind speeds, seismic loads or arctic snow loads if necessary. We build in our own floors or provide for precast floors, and can design and build in stairs and lift shafts. We also offer as part of our service the ability to design our steel structures to accommodate overhead cranes and gantries, the ability to detail and install glazing and cladding systems complete with integrated personnel and vehicle access doors along with many other accessories. REIDsteel bridges are designed and constructed to British Standard 5400 Highway Bridge Loading Specification or other National Codes. Our Steel Bridges can be shipped and erected world-wide and are designed to suit a range of applications and come in a variety of types dependent upon your specific bridge requirements. Our services include the complete structural design and construction of your choice of bridge and we use only the highest quality British steel, which can be supplied hot dip galvanized if required. 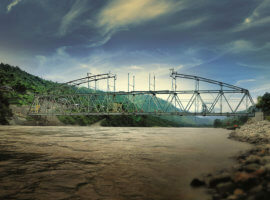 We have included below some examples of steel bridge types and applications but full details can be found under our dedicated Steel Bridges website. Reidsteel can manage your Steelwork project from inception to completion. REIDsteel have a worldwide reputation for excellence in the design, fabrication and erection of a wide variety of steel framed structures. 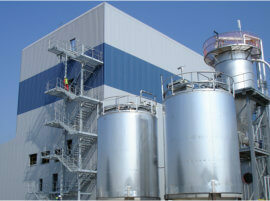 These include, amongst others specialist structures for the waste management & waste handling industry. 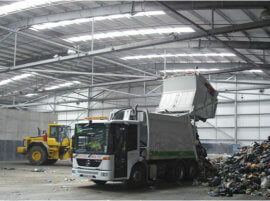 We have the ability to design and create very large clear span structures to maximise usable interior space ideally suited for waste management and recycling facilities. The steel frames for these are suitably protected against the damp, humid and aggressive environments generated inside these buildings. They can also be easily fitted with a misting system to minimise the level of dust created and will allow delivery and processing of waste to be carried out under cover. 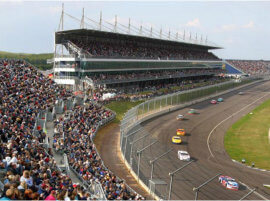 Our grandstands are quick and easy to manufacture and build but most importantly, they are easy to maintain and cheap to own. All safety requirements are built in. REIDsteelmanufacture the stadium gangways, entrances and exits (vomitories) and tunnels, in precast concrete or decorative steel. We will design and supply the suspended floors for offices or function rooms with precast concrete or insitu cast composite floors, including the staircases. 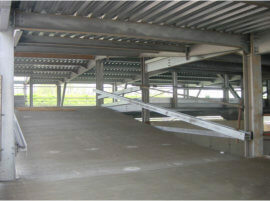 REIDsteel can design and build your multi-storey car parks so that they are safe, easy to use and economical. The advantage of a steel framed car park is that the building can be designed around the car parking, and not the car parking designed around the building, as is the case with concrete car parks. Steel framing is lightweight, strong and slender, allowing large clear open floor spaces, with minimum floor to floor heights. 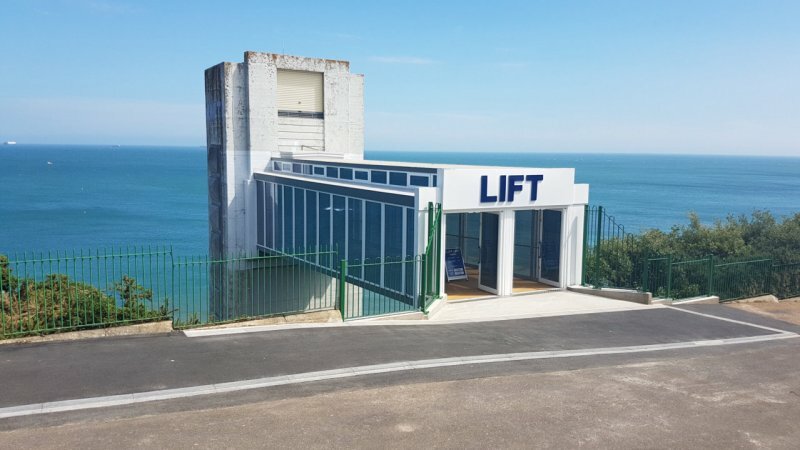 We do the complete structural design and construction of the multi-storey car park and use only the highest quality British steel, which can be supplied hot dip galvanized if required. 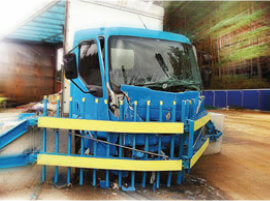 We can arrange shipment and erection of steel structures to most countries. 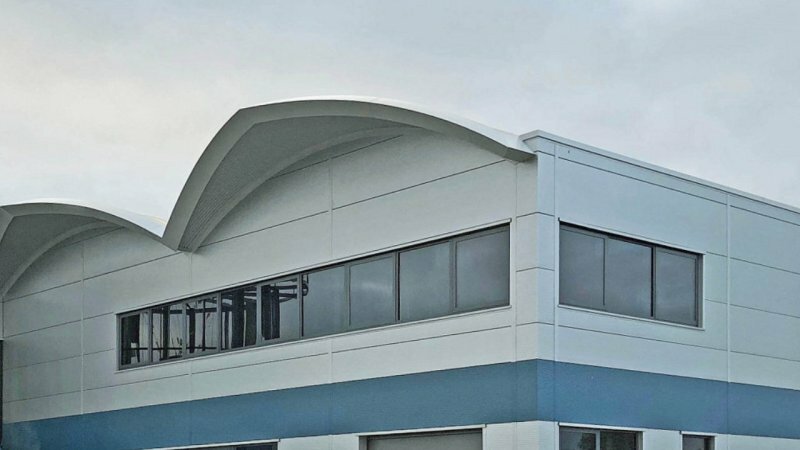 Our specialist knowledge allows us to design buildings including parking lots to withstand high wind speeds, seismic loads and arctic snow loads if necessary. REIDsteel have great experience in designing and erecting hurricane, earthquake and tsunami resistant structures including civil and military buildings for the world’s most volatile climates, as well as advanced structural engineering and design to resist blasts. We can also advise on the structural strengthening of existing buildings and bridges to better resist loads and natural disasters, or to make them life-safe by utilising best practice earthquake engineering techniques. REIDsteel use innovative structural design techniques to create resilient structures with resistance to damage caused by an earthquake, hurricane, flood and tsunami. 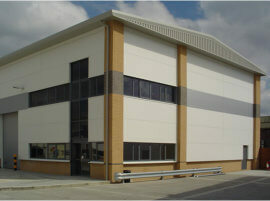 Our solutions also include blast resistant buildings. In addition Reidsteel can design and create your structures to take advantage of natural ventilation techniques to cool your building interiors. Steel churches and places of worship made by REIDsteel can be shipped world-wide and can be designed to suit a variety of requirements. REIDsteel undertake the structural design, make and ship the steel frame and roofing for church buildings (as well as suspended floors, galleries, stairs etc), while local masons, glaziers and craftsmen will build the walls, windows and doors. We can even help your masons to form rounded or gothic arches for doors and windows. 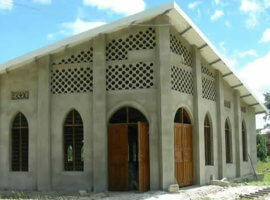 Our churches are built using prefabricated steel frames and match the majority of styles required for a church building. Working with our engineers and designers on the look of your steel framed church, we can build your church in the most cost effective way. REIDsteel are proud to have successfully designed and tested a range of high security, crash resistant gates and barriers to the BSi PAS 68 test specification. Initially designed for military applications, the Dragon’s Teeth design brief stated it should be easy to deploy with no foundations, simple to assemble, relatively inexpensive, and yet be highly resistant to high speed vehicle attacks. To extend their use, we designed a range of gates to fit within them and then put the Dragon’s Teeth and gates through extensive vehicular (7.5t truck) and blast testing. REIDsteel twin bollard gates do require foundations, but can be of a more aesthetically pleasing design for the commercial market. The largest opening of a twin leaf gate is 12m – wide enough to close off a four lane roadway. Co-ordinating multiple contractors can be a thing of the past – Reidsteel offer multi discipline projects with one point of contact for the entire job. REIDsteel are fully compliant in the CE Marking of fabricated structural steelwork – Now a legal requirement in UK and Europe. Our export team has arranged shipping and erection of projects across 130 countries, in some of the most remote parts of the world. 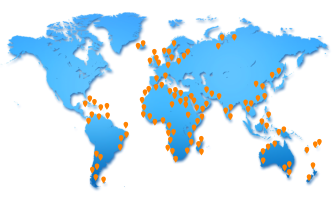 As well as commercial interests around the globe, Reidsteel are actively involved in a variety projects worldwide that undertake major infrastructure improvements to those countries. Hospital buildings in africa provide much needed health and emergency facilities to remote locations and our road bridges make these places more accessible. Projects are many and varied and demonstrate our ability to provide steel structures in just about any location in the world, no matter how remote. Click on the map above for an interactive view of some of our more recent projects or here for an historic Journey. Reidsteel provide many steelwork projects throughout africa: Hospital complexes, Grain Warehouses, Road bridges, Factories, Schools etc. Click on the map for further information.